We’ve got Spirit, Awards and Toys! Last week we had our quarterly staff meeting and the room was full of company spirit as our employees were all sporting CC Pace apparel. 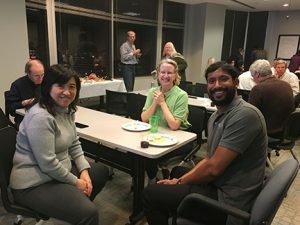 We also had a new twist when it came to discussing company business as some of our consulting teams made project videos to highlight their work – it was an entertaining way to learn about their current assignments and the clients they support. Once we got all the serious business out of the way, we had some fun as we recognized 3 employees who had reached milestone anniversaries. First, we have Deepti Agarwal, Senior Technical Recruiter who is celebrating 5 years as a member of our recruiting team. 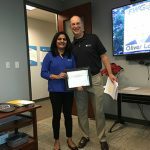 Deepti was recognized for her exceptional record of having a 95% retention rate for her placements. Her colleagues are quick to point out that her attention to detail gives her the ability to find the perfect match for both the candidate and the client. Deepti received the traditional gag gift presented by President, Mike Gordon and a service award. Way to go Deepti! Second, we celebrated Clay Everhart our Facilities Manager for 20 years of service. Clay has a big fan club here at CC Pace as he is always the first to lend a helping hand, volunteer or assist with a project (and of course make a joke). Most importantly, he does everything with a smile and always provides a funny quote of the day for our staff to enjoy! Mike presented Clay with a service award and, of course, a gag gift! But, the highlight of honoring Clay came next. 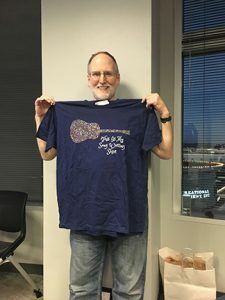 For those who are not familiar with Clay, he also plays the guitar and is a songwriter and he performs his original pieces for everyone at CC Pace when there is a milestone anniversary or retirement. While they are often hilarious, they can also be very sweet and touching. To celebrate his anniversary, the entire CC Pace team wrote and performed a song for him to the tune of Barry Manilow’s I Write the Songs! A classic moment for sure and one we will all remember for a long time. Thanks Clay for everything you do and all the laughs you bring to CC Pace! Third, we had the honor to celebrate the 40th anniversary of Mike Gordon, CC Pace President. Mike started for a company named R. Shriver Associates in the late 70’s. In 1980, Mike and one other person purchased the branch and that was the beginnings of CC Pace. For 40 years Mike has led CC Pace with the highest integrity and ethics and through his strategic vision, he has built the company where it is today – a known leader in our market place. 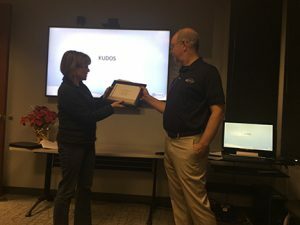 Mike was honored with a service award presented by Dawne Ward, COO. Dawne also had the special privilege of giving Mike a taste of his own medicine and presenting him with some gag gifts, and we have to admit he looked a little nervous when that part came around! The team also presented him with a golf outing to enjoy. Cheers to you Mike and thank you for your outstanding leadership of CC Pace! The staff meeting also marked the last day of our Toys for Tots drive! Toys for Tots was started in 1947 and has distributed over 548 million toys since it began. 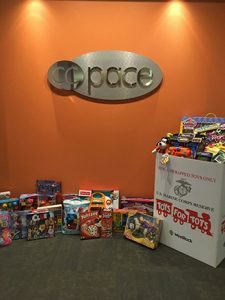 We were able to fill two very large boxes with toys for our local community. The donations we received included something for everyone with baby dolls, cars, board games, craft sets, Legos and much more! Who doesn’t love the chance to make a child happy?! A big shout out to all our employees for participating in this event!